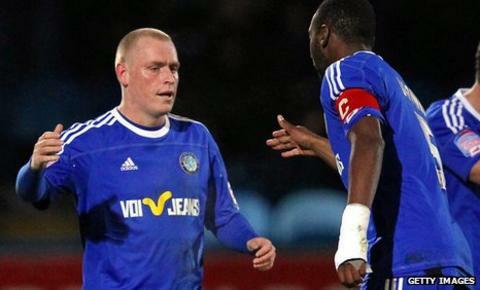 Macclesfield secured an FA Cup third-round home tie against Bolton after beating Blue Square South's Chelmsford City in their second-round replay. Defender Carl Tremarco scored the only goal of the game when he was fed in on the left before sliding his shot past goalkeeper Stuart Searle. Shaun Brisley skimmed the bar with a header, while Tony Diagne poked his shot a yard wide for the Silkmen. Chelmsford's best chance fell to Cliff Akurang, whose header was easily saved. The home side were marginally the better team throughout, however, and could well have been in front as early as the third minute when Nat Brown's eight-yard half-volley was cleared off the line by Chelmsford right-back Aiden Palmer. Macclesfield played Bolton in this season's Carling Cup, losing 2-1 at the Reebok Stadium. After having taken the lead midway through the first half, the hosts had a number of chances to double their advantage and make the closing stages less tense for themselves, but they spurned them. Searle saved well from a George Donnelly drive before the same player fired a shot into the side-netting. They were also denied what seemed a legitimate second goal when Matt Hamshaw's finish was ruled out because Donnelly was in an offside position. In the last 10 minutes, Chelmsford put pressure on the home defence, but could not create a clear-cut chance. "It's great for the players, club and supporters that we've managed to squeeze through. "I thought we did a professional job on them. "It's lovely, lovely for everybody connected to the club." "I thought we took a while to get to the pace of the game tonight, we seemed to take 30 minutes to get our second wind. "They put us under a lot of pressure, with balls in the box. We weathered that early storm, it was a sloppy goal we gave away. "We played at a better tempo second half, I thought we pressed them high and passed it better, but we couldn't break them down."